Tonight's dinner was a bonanza of tasty, summery veggie delights! We were oohing and ahhing as we ate. We were out of lettuce so I made up a lettuce-free salad. 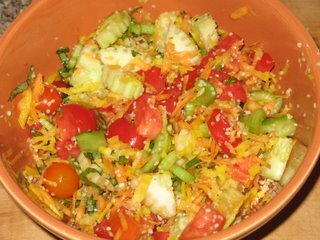 There was plenty of other good stuff: tomatoes, cherry tomatoes, grated golden beet, grated carrots, celery, cucumber, green bell pepper, fresh basil, and hemp seeds... all served up with some delicious flax oil salad dressing. The salad dressing is based loosely on the recipe in "Becoming Vegan"... only I totally changed the spices to suit Matt's tastes. It's quite good. Also... I present you with the official Food Of The Gods: First, I started with a Viccolo cornmeal pizza crust. If these are available in your region, I strongly encourage you to immediately drive like a maniac and go get some! (As we were eating, Matt said "This is the best crust you've ever made!"... ha ha, sigh. I had to fess up!). Next I pressed a couple cloves of garlic, and spread it around on the crust with about 1 T of good olive oil. 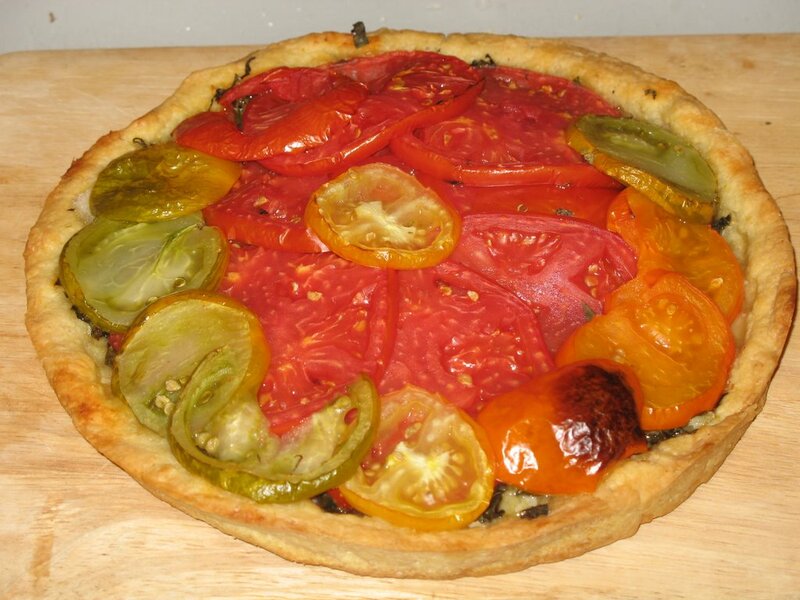 Covered it all in heaps of very finely chopped fresh basil... and topped with mounds of tasty heirloom tomatoes. Cook at 425 F for 25 minutes. So insanely good. Lastly, I wanted sweeties last night... so I whipped up a batch of Lemon Gem Cupcakes from VwV... 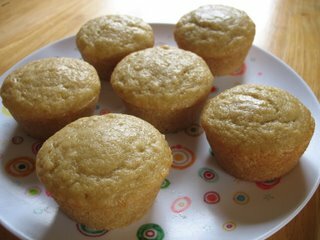 I skipped the frosting, they're plenty delicious as it is. There were more... but of course we nipped right in! Hi Amey! So far so good... that pizza looks awesome! I love me some fresh tomatoes. thanks for my first official comment Chris!! Yes, fresh tomatoes are a very magical thing indeed! Those pizza crusts are so good! It is hard to get inspired to make homemade pizza dough when those things are around. they are really outta this world! I have to practice such restraint to only buy them every few months. otherwise I could really pig out on them every day!